Kansas City's Kauffman Center for the Performing Arts. Creativity is in the air and this weekend marks two debuts. We sit down with a local filmmaker about his newly produced concept short, which debuts Saturday. 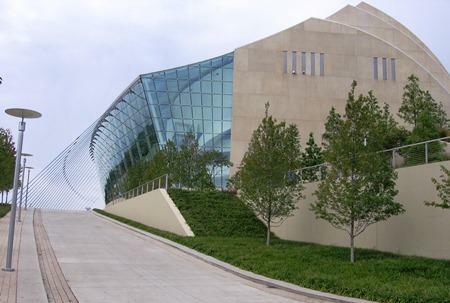 But first, we head to Kansas City for the long-awaited opening of a new performing arts center. The concrete-and-glass shell-shaped $413 million dollar Kauffman Center for the Performing Arts opens tonight in Kansas City. It’s been almost two decades in the making. A bit of giddiness was in the air at a media tour yesterday—tempered by awareness of the work ahead. Laura Spencer was there. “The Pardoners,” a short film created in Columbia by local filmmaker Brian Maurer, is a retelling of one of the stories from Chaucer’s “Canterbury Tales.” Maurer shot, filmed, and produced the piece here in town and will be developing it into a television series. Elizabeth Trovall sat down with him to chat about the piece and realities of filmmaking in mid-Missouri. Catch the free screening at Ragtag cinema Saturday morning followed by a question and answer session with the director and crew.